Spool up the FTL (Faster Than Light) drive, we’re breaking the laws of physics again. Scientists, being conservative types, are still taking measurements, double and triple checking their slide-rules to make sure they didn’t measure something else by accident or possibly turn on the microwave while running the 1300-metric-ton particle detector, and thus hose up the very delicate measurement of how fast a nearly massless particle can go. Or maybe the GPS wasn’t calibrated. But after 3 years and 16,000 neutrino measurements, it might be possible that Einstein Was Wrong. Einstein’s Special Theory of Relativity says that nothing can go faster than light – if it does, either time goes backwards or you become infinitely heavy. Which seems impossible (maybe). That maybe is where science fiction writers live. Last week I finished up a critique of a new crit partner’s YA SF manuscript. I’m generally open (if I have time) to swapping crits with someone new, because I think you have to continually seek out fresh eyes for your work. And because I like to pay forward all the great crit help I’ve gotten in the past. But when I found out her MS was a historical-SF with Nikola Tesla as a character, I was practically begging her to let me crit. She wanted feedback on the science in her story, so it was a great match. If you don’t know who Nikola Tesla is, you need to fix that. He’s the prototype for all our models of mad scientists, an actual (crazy) inventor in the late 1800’s/early 1900’s who dreamed up alternating current (AC) (as Edison’s bitter rival), wireless radio (Marconi? No, not him), and quite possibly a Death Ray. He also was afraid of round things and loved pigeons with an unhealthy zeal. How could you not write about this guy? In my critique, I tried to point out places where the story-science was implausible or contradicted by real-life known science. Of course this is science fiction, but it’s important to build a world that hangs together and doesn’t willy nilly toss off things that can’t possibly happen. You want to be scientifically plausible, so that it pulls people IN rather than OUT of your story. Sometimes this means you need to be especially skillful in your descriptions, but sometimes less is more. Overexplaining the intricate details of your Death Ray may simply make it less plausible. It’s a tricky balance. I actually think the best science fiction takes a page from the fantasy playbook and doesn’t limit itself to something that seems “likely” to be invented someday. Dreaming big shouldn’t be limited to writers who play with magic wands and sorcery. In fact,speculative fiction writers need to dream even bigger, otherwise those pesky scientists will catch up to you with their invisibility cloaks. Maybe neutrinos actually go a bit faster than the speed of light. Maybe not. But for the next science fiction novel that I dream up, I’m going deep into the maybe zone to see what I can find there. Oh CERN. They certainly are doing some interesting things. It would have been a great story if it really had created a black hole when they first fired it up. hmm, I have a feeling I read the same story 😉 Tesla was an interesting – if strange – guy. 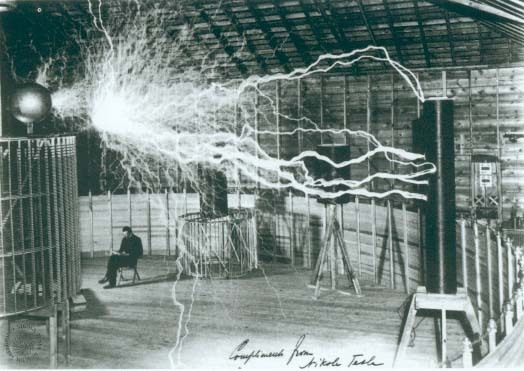 Tesla was also responsible for wireless electricity. He tried very hard to figure out a way to get free power to the world. Dang that guy was awesome. Technically. I will be someone who waits conservativelly by to believe this. Non-matter FTL, yes, physical matter — um, that's gonna throw a big ole quark into the physics machine. I saw that. It's fascinating. We were discussing it up at the observatory the last weeks we were open. It was an X-neutrino… a Meutrino. OK so I am not normally a Sci Fi fan, but since reading Open Minds and now all these MG reviews and I am thinking I have been cutting myself off from a fascinating genre – especially when it is more closely linked to actual science, which rocks my boat even more! I know absolutely nothing about science, truly. But I do know that Tesla was amazing and he's a great subject for a novel! What was the book you crit-ed (is that a word?) Was it Goliath by Scott Westerfeld? I just finished it this afternoon and Tesla plays a major role. If it's a different book, I'd like to know about it! 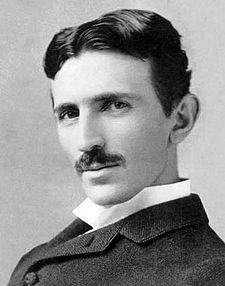 Tesla was a fascinating person and would like to read more about him. Faster than light? Einstein wrong? All awesome stuff! Thanks for the great pro-Tesla post, and I was thrilled by your critique and your suggestions for fixing the science. Just got a *really* positive email from my agent, so looks like I'll be trying to whip this manuscript into shape in the next 6 months! There is loads of great research going on these days – I'm fascinated by it! There's still so much we don't know. "You want to be scientifically plausible, so that it pulls people IN rather than OUT of your story. Sometimes this means you need to be especially skillful in your descriptions, but sometimes less is more." Which is why I tend towards reading fantasy, rather than sci-fi. Though I do love sci-fi. Makes me think of the old adage, the truth is stranger than fiction! Tesla in a story? I think I would be hooked, too! So…. you like to read sci-fi stories of other writer friends and can provide feedback on the science? My SF tends to be more biology related, since that was my major (oh so long ago!) but if I run into any physics over my head (not hard to do) I may see if you're busy! Though after making a statement like that on your blog, you may find yourself overwhelmed with folks asking you to read their stuff! Hey why not? I mean not that long ago, the world was flat and the center of the universe. It was a known fact. Plus man on the moon? NO WAY! You never know where things really go. iPads? Pfft. But I was supposed to have a flying car when I grew up – where's that???? I loved the vision of Tesla in "The Prestige." Cool movie! argh… see? You've just put your finger on all the reasons my so-Miss scifi is still sitting in the drawer. That one's going to be work for Ms. non-scientist, non SF-reading me! Awesome! There are days I wish I'd gone into the sciences – specifically research. What fascinating ideas must get thrown around by these folks! I love messing with plausible science and taking it a step beyond. I also love freaky science finds like an article that said "Strange! Humans Glow in Visible Light." I say "Go Tesla."